There is an art to selecting and sending the perfect corporate gift. Making sure important recipients feel like you took the time to choose something made especially for them pays back in more ways than one. No one wants to send or receive a gift that gets tossed aside and forgotten faster than the time it took to open it. From delivery to unboxing to sampling the delicious artisan items, Totally Chocolate gifts are sure to be an unforgettable experience. Bulleted out below are the three most important things to remember as you go about your gift search. We have also sorted through our best selling gift options to outline incredible ideas for all budgets and corporate relationships. The holidays can be stressful and are always busy, so let us help you check one major item off of your list! Something that was clearly well thought out and made specific to an individual or a company is always a hit. Personalizing can mean everything from adding a card with a note written specifically for the business gift recipient to adding your logo or customized artwork in non-traditional ways. Totally Chocolate’s online customizer makes personalization easy. Simply go online and pick your product, select your packaging, flavors and designs, then personalize your chocolate by uploading art directly to www.totallychocolate.com/create Whether it’s an indulgent two-pound bar, an ensemble of shareable chocolate or a set of European-style cookies topped with rich, creamy Belgian Chocolate, there are options for virtually every design – and budget. Make generic gifting a thing of the past. For your gift to really stand out, it needs to be extra special from start to finish. Create the ultimate branded gift or elegant self-promotion using our extensive collection of fully customizable chocolate gifts and promo pieces. Make a lasting impression and go way beyond business as usual by working with our team of chocolate specialists to create a one-of-a-kind masterpiece that every client, customer and friend will truly appreciate – and brag about for months to come! -Receiving the shipment—Gone are the days where a plain brown shipper box is acceptable. It says “generic” from the moment it arrives. Instead, your gift should arrive in a shipper box that immediately communicates the specialness of what’s inside. Colorful, branded and made with the finest materials makes all the difference – and it makes everyone in the office envious too. – Opening the box—Once the shipper box is opened, the magic continues. Imagine a package with a fully customized lid or one of eight beautiful, hand-drawn sleeves enveloping a silver, gold, red, black or Signature blue box. We have every taste and possible preference covered in our in-house-designed prints. From stunning poinsettias to modern, shimmering trees to playful candy canes, whichever you choose is sure to delight. And don’t forget to add a personalized note via a gift card or custom folded card! Discovering what’s inside—Opening the box lid reveals custom engraving with unparalleled precision detail, made of the purest, most decadent chocolate with a smooth, velvety texture and flavor on par with the great chocolatiers of the world. Your clients and friends will marvel at the creaminess and rich flavor of any of our chocolate gifts! Disposing of the empty box— Our beautiful packaging is recyclable. We want the gift to leave a lasting impression on the recipient, not the environment. A luxury gift tower. Go totally luxe with the Totally Chocolate Indulgent Gift Tower, a trifecta of taste that will leave business executives feeling special all season long. Totally Chocolate’s indulgent chocolate bar, made with pure Belgian chocolate, deluxe European-style cookies covered in an assortment of milk chocolate, dark chocolate and peppermint bark are topped with a showcase of 12 decadent and dreamy dark chocolate salted caramels. Choose a design that creates a perfect presentation for everyone on your holiday gift list. Another excellent way to catch the attention of executives and other decision makers? A curated tasting box filled with an impressive selection of Belgian chocolate treats, such as our best-selling chocolate-drizzled popcorn, hand-batched toffee covered pretzels and creamy-with-a twist crispy pearl bark. Or opt for a mini-tower featuring deluxe European-style sugar cookies covered in divine and creamy goodness and made with pure Belgian chocolate along with an assortment of our popcorns, pretzels or bark. A curated tasting box is always a welcome business gift. Try the Peppermint Delights Luxury Tasting Box, a selection of dark & white chocolate peppermint goodness to taste and share. Perfect for someone you want to celebrate with, the stunning gift box is decked out in a colorful candy cane theme and features best-selling peppermint popcorn, individually-wrapped peppermint pretzels and individually-wrapped peppermint bark squares. The thought really does count with this versatile and joyful gift! – Inspire oohs and ahhs with a gift that works for large groups! 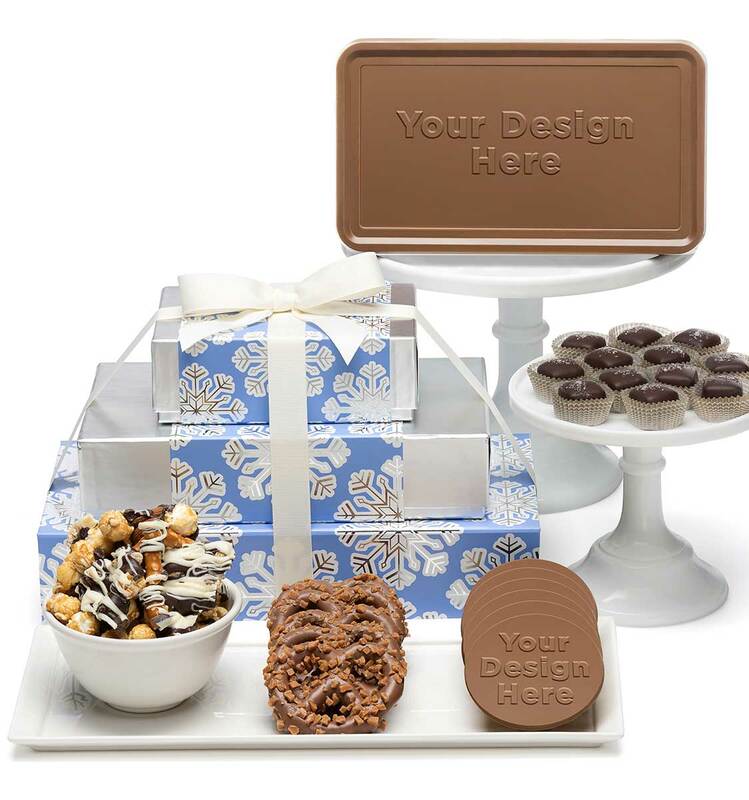 This full custom engraved chocolate 45-piece ensemble guarantees a smile. With 44 delicious Belgian chocolate squares stacked in two layers and surrounding a personalized 4″ x 6″ chocolate centerpiece, this assortments makes a great gift for your special clients. Why give a boring gift basket when you can wow them with a customized Luxury Tasting Box filled with Totally Chocolate’s best-selling chocolate drizzled popcorn, hand-batched milk chocolate toffee covered pretzels and custom engraved Belgian Chocolate Cookies? Presented in a super-luxe embossed gift box that stands out in mountains of basic holiday gifts! Bring holiday to a whole new level with a 24-piece collection of custom-engraved, precision-crafted Belgian Chocolate cookies, each topped with either rich Belgian milk or dark custom engraved chocolate. Or, if you’re focused on flavor, you can choose peppermint white chocolate sugar cookies, cookies & cream white chocolate Oreo cookies, or cake & sprinkles white chocolate sugar cookies. “Best cookies I’ve ever had,” is the response you can count on! Our Belgian milk and dark custom logo chocolate bars give you a way to customize and personalize without breaking the budget. These remarkable customized Belgian chocolate bars are remembered long after the last bite and are perfect for Christmas business gifts. 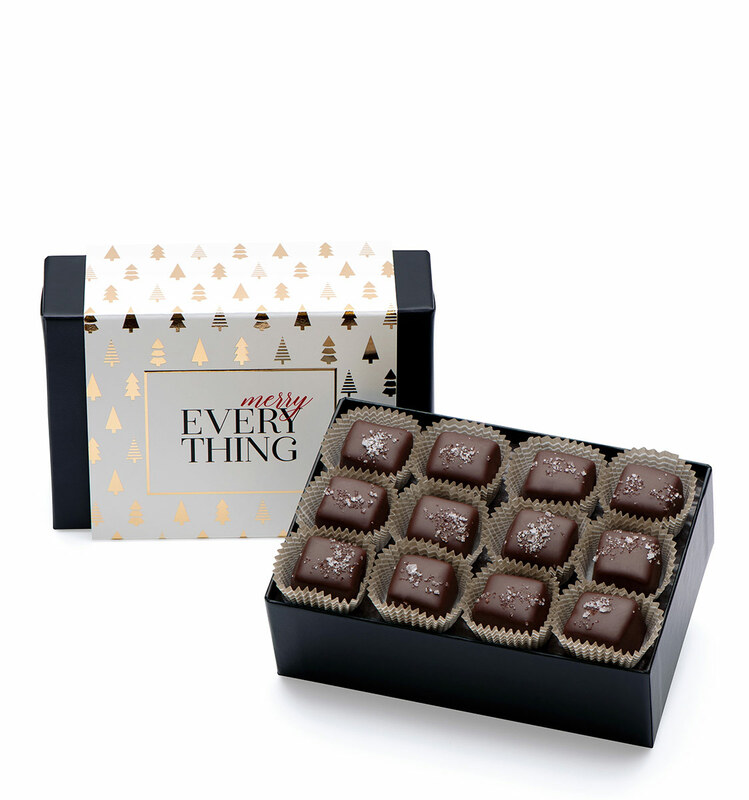 If ever there was a sure-to-please gift, it would be Totally Chocolate’s divine and decadent salted caramels! Buttery caramel is surrounded by artisan dark chocolate and sprinkled with delightful fleur de sel. The luxe gift box accented with a design of your choice ensures this 12-piece gift will inspire smiles from everyone on your team!